The NASA Goddard Space Flight Center Innovative Technology Partnerships Office (ITPO) is excited to announce a special partnership forged between Goddard’s ITPO and Tor Books in releasing the new book, which is the first title in a new series of “NASA-Inspired Works of Fiction” that are intended to not only educate, but also encourage young adults to examine the rewarding careers that science and technology have to offer. With the enormous popularity of science fiction—countless people who work in the fields of science and technology credit science fiction as a significant inspiration for their career choice—the ultimate goal of the series is to raise awareness and inspire the study of the STEM subjects (science, technology, engineering and mathematics), while educating the general public on the significant role NASA plays in everyday lives. 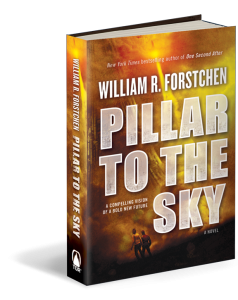 In PILLAR TO THE SKY, Forstchen explores the concept of trying to solve very real problems of the 21st century—dwindling oil supplies, increasingly dangerous pollution levels—through construction of a space elevator that could enable unprecedented access to space.